The strategy of the European Union (eu) did seem to be transformed in the conference centres of Cancun. A coherent eu policy is non-existent. Europe is deeply divided between the American satellites (the uk, Spain and Italy) and the Gaullist camp (France, Germany and Belgium). There is distrust and antagonism among the European nations as well as between the various ministries of a country. In Germany, for instance, the economics and environment ministries regularly attack each other in public. Such infighting makes it amply clear that the eu is simply not a player with smart tactics, unlike the us. The picture will become clearer with 10 new members joining the eu next year. Some experts perceive that the 'additions' will strengthen the American camp in the eu. The new members certainly do not have a grand global strategy. They will make decision-making in the eu more arduous and time-consuming. The new eu constitution, currently being negotiated, will also create problems: it will strengthen the position of member states vis--vis the eu commission. This means less unity, and more thrust on national self-interest. Cancun seems to be less spectacular now than when it concluded. Retrospectively, what changed at Cancun? A group of developing countries just said no to the us and the eu. Did they win a battle? No. The us has been taking a bilateral stand and would have continued to do so even with a 'successful' Cancun. 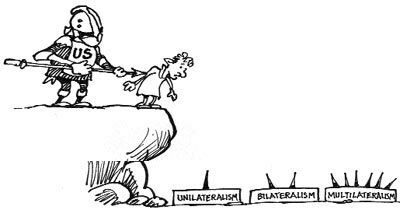 The eu does not like bilateralism too much in theory but it has a long list of bilateral investment treaties. To make the list a bit longer would not make any difference -- business as usual. The world must observe the us very closely now. After Seattle, there were some far-sighted commentaries about how non-governmental organisations (ngos) will have to defend the wto against the us Republicans. The views may be proved correct now. On the other hand, it is not right to agree with 'comments' on how the world needed an agreement in Cancun for the sake of multilateralism. How multilateral is wto? So far it has been a condominium of the quad (the us, eu, Japan and Canada). It needs to be transformed into a truly multilateral organisation, with or without the 'quad'. Cancun was a successful first step in that direction, if one looks at it in terms of 'realpolitik' and 'Machiavellism'. wto may not be able to survive the attempt to transform it into a truly multilateral organisation, because the 'quad' will not accept it. Therefore, there is no point in shedding tears at its 'imminent' demise. The world needs a new organisation and one should do one's best to divide the 'quad'. This task may not be too difficult given the increasing likelihood of trade wars within the 'quad'. The self-declared winners of Cancun (g-21 and the ngos) should soon come forward with concrete proposals about how to make the world multilateral. It is inconceivable that without a lot of power politics this will be possible.